At Village Market Food Centers, community service and involvement are high on the list of our priorities. The following are just a few ways we stay involved with our local comminties. Dollars for Education is a program that supports our local schools by giving them the opportunity to earn money for equipment and supplies, etc. they need. 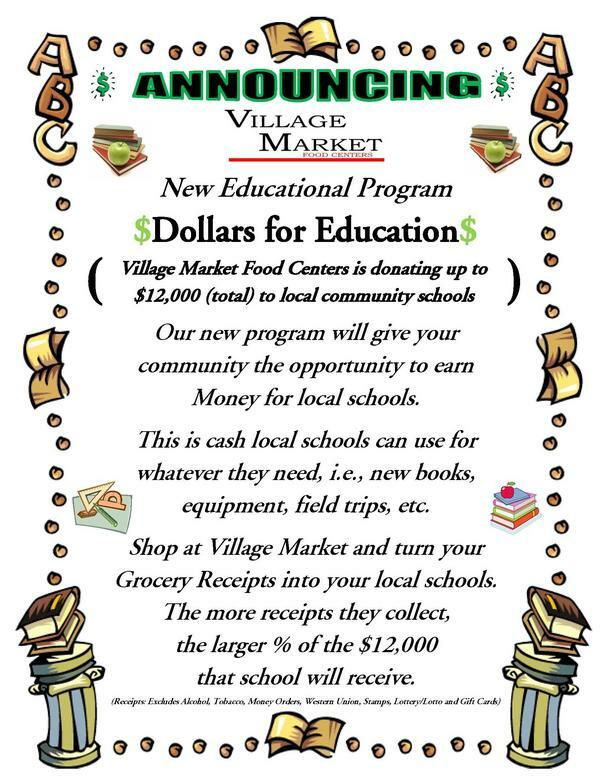 Village Market Food Centers will be donating up to $12,000.00 total to local schools during the school year. Donate a Bag gives customers a chance to donate non-perishable items to a family in need during the holiday season. Each store locations gets in touch with local churches and organizations to help distribute the donated product. Count on Us for Community Support! Every year Village Market lends support to causes no matter how great or small. Listed below are some of our community programs.